Nut lovers rejoice. 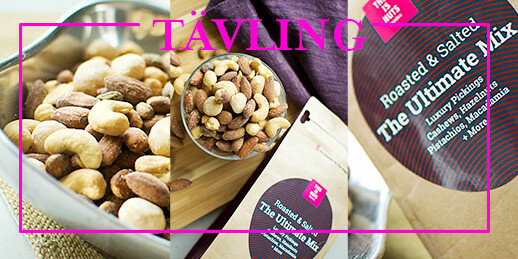 This Is Nuts' delicious and natural snacks and sweets are now available from Bodystore.com, a major online retailer for health food products in Sweden. To celebrate, we're giving away 16kg of mixed nuts to one lucky winner, just in time for Valentine's Day! "Just like us, Bodystore has a holistic perspective on health and wants to help people live a healthy an active life without lecturing," says Ranja Maria Vardali, This Is Nuts' founder and CEO. "So being associated with their brand comes naturally to us." Since the launch happens the same week as Valentine's Day, This Is Nuts is also hosting a contest that gives you the chance to win 16kg of our bestselling Roasted & Salted The Ultimate Mix to share with somebody over a romantic nut date;) Head over to Bodystore's Facebook page or Instagram to find out how to win. You have until February 18 to enter. "We want people to think outside the traditional box of chocolate for the holiday of love," says Vardali. Initially, you will find thirteen of This Is Nuts' most popular products on Bodystore.com, including our bestselling nut mixes, almonds, dried fruit and organic coconut flour. Bodystore will also sell five of our snack bags sporting natural blends of nuts, seeds and dried fruit and berries. "We think the small snack bags will go over really well on Bodystore, since they have active and sporty customers. Nuts are a perfect recovery snack and our small bags easily fit in your pocket or gym bag," says Vardali. Bodystore sells a wide range of products for an active and healthy lifestyle and shares This Is Nuts' ambition to offer a product line that is as green, natural and organic as possible. "This Is Nuts is a perfect fit for us, since we see a lot of demand for these types of products from our customers," says Bibbi Livaja, purchaser with Bodystore. "Natural, high-quality products at a good price." Hop on over to Bodystore check them out for yourself, and don't forget to enter that contest!